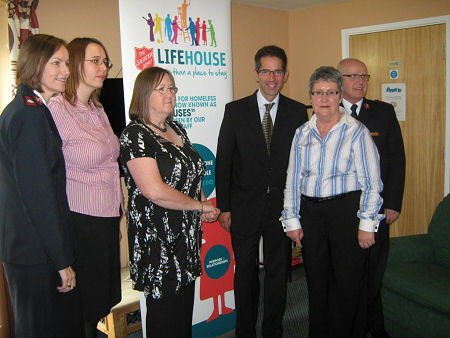 Jonathan Djanogly has praised the work of Salvation Army staff at the King’s Ripton Court Lifehouse in Sapley. Kings Ripton Court is a Salvation Army Lifehouse with 36 places for people aged between 16 and 25. More than a place to stay, Lifehouses are places of change. Residents are given a keyworker, and training needs are identified so that people can live independently when they leave. The training includes the ‘One Step Forward’ resettlement programme which provides information, skills and knowledge on areas including maintaining their future tenancy, building self esteem and confidence, budgeting, cooking, personal relationships, fire safety, security, and housing matters. “I first visited Kings Ripton Court ten years ago, soon after it opened. “It's been a pleasure to visit again today and be reminded that Kings Ripton Court is not just a place to stay, but is a place where lives are transformed, given purpose, and people are restored into independent living. Each year, The Salvation Army holds a fundraising appeal, with Salvation Army members and volunteers asking for donations to the church and charity’s life-changing social and community work. The theme for this year’s appeal is ‘Mending Broken Lives’.